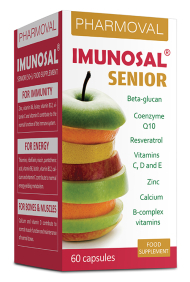 Imunosal® Senior capsules for adults (50+), contain beta-glucan, 30 mg of coenzyme Q10 and 100 mg of resveratrol in daily dose. Not recommended for women while nursing or pregnant. 1) Zinc, vitamin B6, folate, vitamin B12, vitamin C and vitamin D contribute to the normal function of the immune system. 2) Thiamine, riboflavin, niacin, pantothenic acid, vitamin B6, biotin, vitamin B12, calcium and vitamin C contribute to normal energy-yelding metabolism. 3) Riboflavin, vitamins C and E and zinc contribute to the protection of cells from oxidative stress. 4) Riboflavin, niacin, pantothenic acid, vitamin B6, folate, vitamin B12 and vitamin C contribute to the reduction of tiredness and fatigue. 5) Calcium and vitamin D contribute to normal muscle function and maintenance of normal bones. 6) Thiamine contributes to normal psychological function, normal functioning of the nervous system and normal function of the heart.